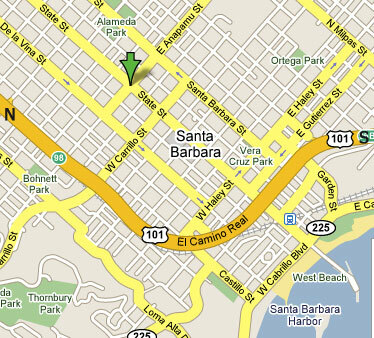 Metro Entertainment is located at 6 West Anapamu St. in the heart of downtown Santa Barbara, CA. Click on the map below for Google directions to the store. Metro Entertainment has been locally owned and operated since July of 1991. Winner of the Independent's "Best Of.." Award, Metro has been singled out as the best comic shop in town in the era of the big comic boom and has continued to thrive. Originally setting up shop across the street from its current location under the 'Metro Comics' banner, the folks at Metro work hard to bring the best of the realms of pop culture, gaming and art to the local scene. Bob Ficarra is the Owner of the store, able to be reached regarding major purchasing and store concerns. Carla Hoffman continues to make this website. Jim Tourville is the Games Manager, handling purchases for games-related items, as well as handling tournaments and game nights. Mack Petersen dares to run the registers. Matt is here for the chimichangas. Connor is also here for the chimichangas. Hank Romero has tipped his hat g'bye to Santa Barbara to make it big in Hollywood. We still miss the lil' guy. Jamie Andreassen is always more than meets the eye. Ish Ulloa will always run the Flash Museum out of Keystone City. Sanders MacRae moved to Gotham City. Chris Donati is keeping it real. Mia Resella crossed to the dark side. Jon Givetz has joined the cosmic beyond. Jaron Williams has left for the future. John Craighead is out Guarding the Galaxy. Amy Lora returns to Asgard! Chris Bonham am not Webzarro.